Jack Sparrow saves his first mate Gibbs from being hanged for being a pirate by impersonating the judge and having him shipped to jail. 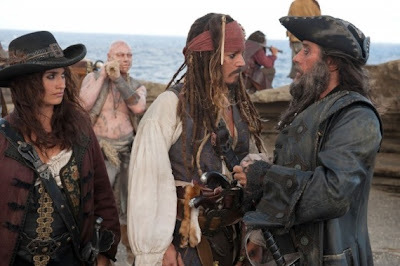 The plan to be taken to the wharf instead doesn't go as expected and he's imprisoned and offered a release if he would share his map to the Fountain of Youth with his old nemesis Barbossa who has recently joined up with His Majesty's Navy. More perplexing for Jack is there's someone in town hiring a crew in his name. Johnny Depp is aback in his typical fluttery style wisecracking his way with his usual mayhem. An old girlfriend, sword wielding Angelica (Penélope Cruz) tricks him aboard the The Queen Anne's Revenge where Captain Blackbeard (Ian McShane) forces him to guide the way to the fountain. Angelica reveals to Jack that Blackbeard his his long lost daughter. They are not the only ones looking as two fisherman had found a man in their nets claiming he was a crew member of Juan Ponce de Le León who had died two hundred years before on an his infamous expedition. The head of the secret service of Spain known as The Spaniard (Óscar Jaenada) has been ordered by King Ferdinand to destroy it as a godless artifact. Barbossa (Geoffrey Rush) is also after the map only to exact revenge on Blackbeard who had sunk the Black Pearl with only Barbossa surviving by having to cut off his leg. There's also a prophesy going around that Blackbeard will meet his death by a one legged man. Sparrow who now sports a unexplained scar shaped like an x on his cheek bone discovers that to get eternal life from the fountain they need 2 silver chalices and the tears of a mermaid. The chalices are on the remains of Ponce de Le León ship. The mermaids are also beautiful with deadly vampire like chompers. Since Keira Knightly and Orlando Bloom are not around for the movies romantic leads, Sam Claflin and Astrid Berges-Frisbey as the Clergyman Philip Swift and the captured mermaid Serena offer some eye candy and winsome glances. There's plenty of fighting, exciting chases, some nice chemistry with Depp and Cruz. Director Rob Marshall is on board this time instead of Gore Verbinski. Screenwriters Ted Elliott and Terry Rossio who had a hand in the convoluted stories of 2 and 3 are still mucking up the waters in this one. Although this version is somewhat more character driven, if that's even possible. Sparrow admits to having “stirrings” at one time for Angelica which is probably supposed to explain why he's involved in this adventure instead for his typical self preservation. The first of the Pirate movies to be shot in 3D is lost with mostly night scenes. It doesn't seem worth the price for the glasses so if it's offered in 2D, do it that way. I feel like this was more of a synopsis than an actual review. I want to know about their performances. What made it good, what made it bad, etc. -- I didn't feel that the chemistry between Depp and Cruz was good. I didn't feel that Blackbeard was a good antagonist. There was actually parts of the movie where I felt bored. I think it had everything to be a good popcorn movie but I had to walk the plank on this one.